- The Christmas Season has officially kicked off with the completion of the 2016 Christmas Tree Festival. The annual holiday tradition, presented once again by Stringam LLP, raises funds for the Chinook Regional Hospital Foundation. In total, more than 4000 people visited the Festival, which was once again held in the Canadian Western Bank Lounge at ENMAX Centre. Themes of trees this year included The Wizard of Oz, Hey Baby! It’s Frosty Outside, Polar Express, Peppermint Magic and Chalet Chic, just to name a few. All together there were 25 trees, each decorated and sponsored by local businesses, individuals and community groups. The event was wrapped up with the Gala and Auction on Wednesday, November 23rd. All of the trees, along with a number of other items, were auctioned off by Balog Auction Services Inc. In total, just under $150,000 was raised – a new record for the event. All of the proceeds will stay here in Lethbridge, for the benefit of the Chinook Regional Hospital. “Once again we are overwhelmed by the success of the Christmas Tree Festival, but also the incredible support we continue to receive from the members of our community”, says Jason VandenHoek, Executive Director of the Chinook Regional Hospital Foundation. “The funds raised by this year’s Festival will be used in part to support the renovation and redevelopment of the Mental Health area at the Chinook Regional Hospital. 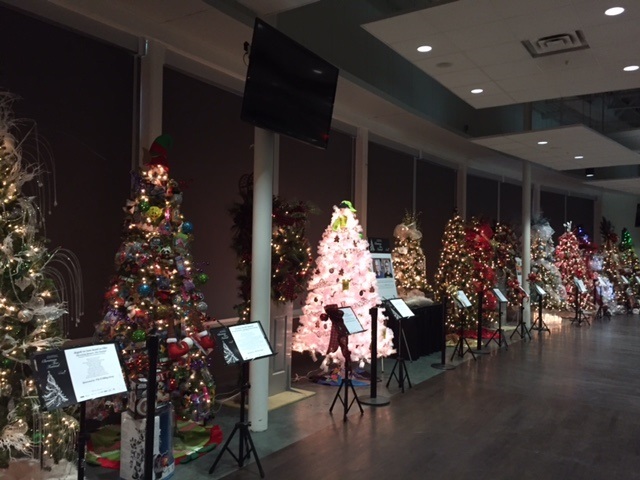 Many trees purchased at this year’s auction were generously donated to community organizations within the city of Lethbridge. Organizations such as the Interfaith Food Bank, St. Teresa of Calcutta School and St. Michael’s Health Centre all will receive Christmas Trees donated to them by various business and individuals. The Tree of Knowledge, Canadian Edition decorated and sponsored by the University of Lethbridge, included books written by Canadian authors, in celebration of Canada’s 150th Anniversary. All of the books on the tree were donated to Magrath Elementary School by the purchaser.